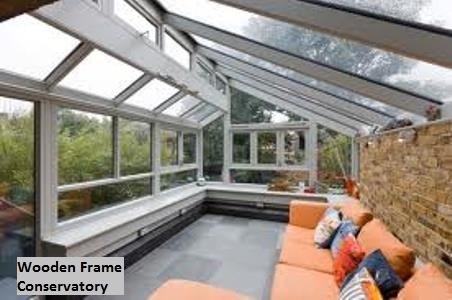 Conservatories are a great way of increasing the internal space in your home easily and relatively inexpensively. Unfortunately they do have their problems. Any conservatory facing the sun for even a small amount of time during the day is likely to get hot during the summer months, this is a fact of life and whilst we can offer solutions to MINIMISE solar heating we can not promise to completly negate the power of the sun. During warmer months when the sun is high in the sky, the suns heat tend to pass very easily through glass and polycarbonate roofed conservatories. Unfortunately once in the conservatory it is quite difficult to get it out again. Originally Conservatories were built using wooden frames which created a large wooden channel within which roof blinds could sit creating a contained void below the glass roof. The air in the void would heat up but be kept within the void by the blind. Each glazed area would have an air inlet at the bottom and another at the top so that the heated air was constantly cycling out through the top vent and replaced by cooler air from the bottom vent. With the introduction of uPVC and aluminium framed conservatories the glazing bars have become thinner and lighter and stronger removing the need for thick beams to support the roof. Unfortunately this also means that the deep voids that were retaining the heated air have also gone, as have the air inlets at the top and bottom. The result of this is that conservatory blinds now have only one way to reject heat and that is by reflecting the heat back through the roof. To achieve this almost all roof blinds are either treated with a solar reflective backing or have a layer of white material (an excellent reflector of heat) on the side facing the roof. Most manufacturers will report that their backing reflects 80% of heat which is probably true. LIFE WOULD BE SO SIMPLE WITHOUT PHYSICS! The problem with all this is the fundamental problem with heat. Heat is basically infra red radiation. 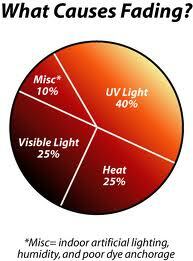 As with all radiation it has a wavelength but that wavelength changes depending on the type of heat. Heat directly from the sun is at a certain wavelength at one end of the infra red spectrum which happens to pass through glass and polycarbonate very easily, however, once it is through the roof is becomes re-radiated heat (the other end of the infra red spectrum) which is at a different wavelength and guess what?.......this new wavelength has a hard time passing through glass and polycarbonate! To cut a long story slightly shorter this startling revelation means that no matter how good the solar reflective surface of a roof blind most (salesmen settle on 80%) you should not expect more than 40 -45% heat rejection from any roof blind system. Glare is not just the brightness of the sun shining in the sky above you. If that were the case, why is that when you stand on your conservatory and look away from the sun you still find yourself screwing up your eyes to combat the glare? 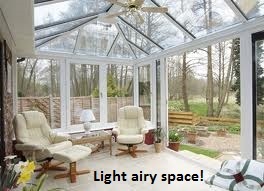 When we order our new conservatory we envision a wonderful light airy space and accordingly we decorate that space with light white or cream walls and light coloured flooring to maximise that light airy feeling. In doing so we are introducing the reason for the glare because when the sun shines down on those lovely light surfaces (including the pristine white uPVC frame of the conservatory) it make those surfaces shine and that is where the glare comes from. The scourge of lovers of windows and light! We crave that light airy feeling so we design our homes to have as mush glass in it as possible but then we find that in addition to the heat and glare when the sun comes out that the colour in our carpet, sofa, oak table, laminated floor etc all appears to be fading! Whilst heat and visible light contribute to fading damage the biggest reason for the damage is Ultraviolet radiation or UV. Actually about 40% or the reason.